Social Currency. When we share something with others, we’ll considering how we’ll look in the eyes of others. 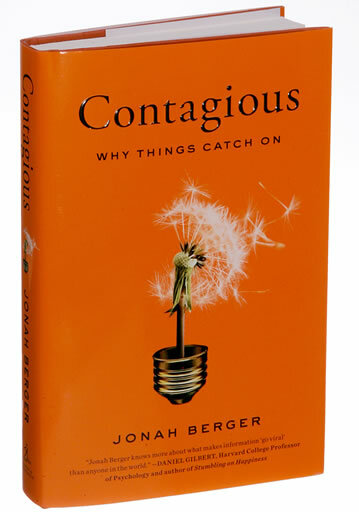 Things that make us seem smarter, cooler, richer, knowledgeable, and leaders get shared more often. Triggers. When someone mentions something, how often does this idea spring to mind? The more connected an idea is with “life as usual”, the more often the idea is likely to be shared. Emotion. High-arousal emotions (anxiety, anger, humor, excitement, and awe) are shared much more often. We respond to extreme highs-and-lows. Public. Most people use “social proof” to validate their choices, since it’s hard to be an know the best of everything. Therefore, the easier it is for others to see people using a product or service, the easier it is to build social proof. Likewise, making public choices private can reduce the spread of an idea (e.g., piracy or illegal drug use). Practical Value. While quirky videos can be funny, their viral lifespan is quite short. As a social species, humans like helping others. While social currency is about the value of sender, practical value is about the value to the receiver (save money, time, improves health, or increased happiness). Stories. A great story connects the teller and listener, and intimately meshes the (above) ingredients with the idea. The story can’t apply to another product or service. It must be integral to the idea, otherwise people won’t remember with the story-viral-association (think of all the funny Superbowl videos you’ve seen, but can’t remember what was being sold).